Nurturing and protecting your landscaping is just as important as the initial investment. Master Plan Landscapes helps you keep your outdoor space looking its best throughout the year. Through our Yard Maintenance program, we apply the same expert attention to maintenance as we do to our Landscape Design/Build services. Call us at 920-849-3376 or drop us an email at masterplanlandscapes@gmail.com to discuss how we'll keep your yard looking its best. 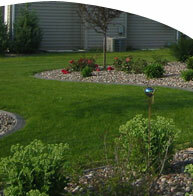 Yard Maintenance services include groundskeeping, Spring/Fall cleanups, weed management, and plant rejuvenation.